Using rosehip oil for stretch marks is all-natural method used by many women. Rosehip Oil has been widely used for the treatment of scars and curing stretch marks. In fact, rosehip oil is one of the best natural remedies against stretch marks. It is rich in Omega 6 Fatty Acids, which help stimulate skin regeneration. Rosehip Oil is also high in Vitamin C that plays important role in the synthesis of collagen and photoprotection. Research  showed, that regular application of rosehip oil brought a significant improvement in reducing of erythema, discoloration, and scarring. Stretch marks are a certain type of scarring in a form of long, narrow stripes that develop on the skin. In beginning, they look like red lines, most recent stretch marks can be colored in pink or purplish-bluish. This color occurs because the young connective tissue is rich in blood vessels. But eventually, they fade and turn over to off-white or white color. They occur when the skin is suddenly stretched and cannot resume normal form after a period of intense growth. Most common causes of stretch marks are pregnancy (actually, up to 90% of pregnant women are affected ), swing weight change (rapid weight gain or weight loss) or puberty. Can stretch marks be cured? Anyone can develop stretch marks. They may occur on the stomach, breasts, hips, upper arms, and lower back. Although they do not hurt, their appearance is one of those things that many women feel super self-conscious about. So, is it possible to cure stretch marks and give you back your clear and smooth skin? What cures stretch marks? How to remove stretch marks? Well, researchers state, that there is no clearly useful treatment for stretch marks though various things are tried . Laser treatments, glycolic acid, microdermabrasion and retinol creams are used in aesthetic medicine to combat stretch marks. 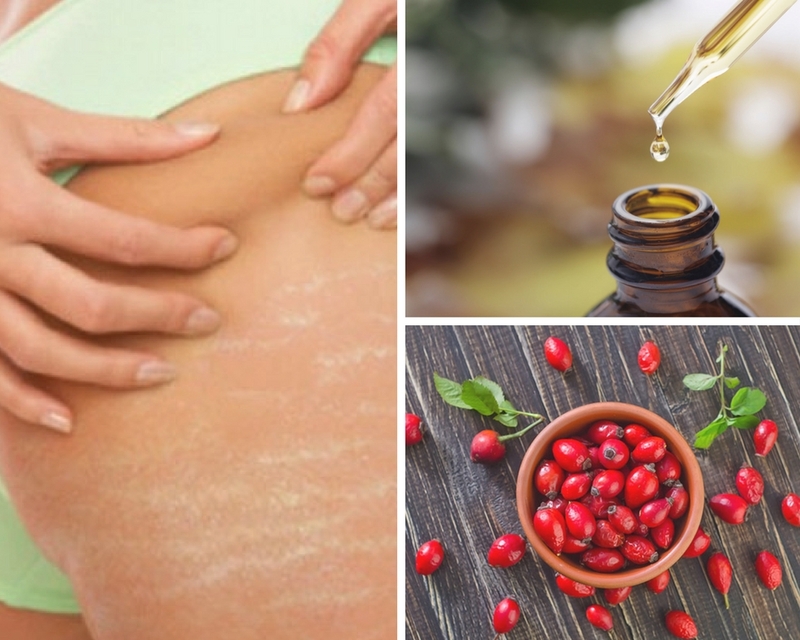 Alongside with those methods, many women give preference to natural remedies, and rosehip oil is one of the best natural cures for stretch marks. Omega 6 and Omega 3 Fatty Acids – keep skin pliable & reduce inflammation. Linoleic Fatty Acid – helps in regeneration of lipid bio-layers, which in turn softens scar’s texture and promote elasticity. Vitamin A – helps to regenerate damaged skin tissues. Vitamin C – prevents discoloration of the skin and stimulates the production of collagen fibers. Clean the skin, make sure it does not have other creams or lotions on it. Poor some rosehip oil in hand and gently massage it to the area affected by stretch marks. Repeat daily for 2-3 month to see the result. Option 1: Use organic rosehip oil with a derma roller to increase penetration and minimize healing time. Plus, microneedles of a derma roller stimulate collagen production deep in your skin and promote stretch marks healing. 3 in 1 Derma Roller includes roller with 1,5 mm needles, which specifically suitable for cellulite and stretch marks. Option 2: Mix organic rosehip oil with Shilajit. Shilajit Resin is an organic, tar-like substance which is often created in the Asian mountains. It has been proven to increase tissue regeneration, so many women started using it to heal of stretch marks. Just mix rosehip oil with 2 grams of Shilajit and massage it on the affected area once per day before going to sleep. This oil comes in a sleek dark brown glass bottle with an easy to use pipette. On top of the undoubtful long-term effects that rosehip seed oil is proven to deliver, Teddie Organics oil has shown a reduction in redness, age spots, scars as well as improved skin tone and elasticity. QUALITY: Just one ingredient ­- Pure, Unrefined Organic Rosehip Seed Oil. Rosehip fruit is grown in an area where pesticides and synthetic fertilizers are not used. CONSUMER REVIEWS: 1) Evens out skin tone. 2) Reduced appearance of stretch marks from pregnancy. 3) Reduced appearance of acne scars. 4) Some reviewers point out that Teddie rosehip oil seems thicker and darker than other rosehip oils. 100% Pure Organic Cold Pressed Rosehip Seed Oil in a dark glass bottle to limit exposure to light for best preservation. Comes with a dropper, very reasonable price for 4 oz of organic oil. Common uses: to smooth out wrinkles, under eye bags and stretch marks. QUALITY: Cold pressed organic rosehip seed oil. By using a cold-press extraction process, the oil is separated from the hips and seeds. Smells like tea, hay or plain oil. CONSUMER REVIEWS: 1) Cuts down acne and skin discoloration. 2) Reduced appearance of acne scars. 3) Reduced red and dry skin patches. 4) Some reviewers point out that oil has an orange tint so it is possible to only put it on at night. This rosehip seed oil is a pure bargain since you get 4 oz of organic oil for a reasonable price. Thanks to the big size of this product, you can use it in preparing your own body serums and apply it to larger body parts affected by stretch marks. QUALITY: Organic Cold Pressed rosehip seed oil. Therapeutic grade. 100% Cruelty-Free. CONSUMER REVIEWS: 1) Visibly reduced surgery scar. 2) Reduced appearance of acne scars. 3) Great for oil cleansing. 4) Some reviewers notice an unpleasant smell. Beauty Rosehip Oil has been an all-time bestseller and is 100% natural and certified organic. It is especially effective in the treatment of post-acne scars and dark spots, dehydrated skin, adult dry acne, mature, and blemish-prone skin. QUALITY: 100% Pure Cold Pressed Certified Organic. 100% Cruelty-Free. CONSUMER REVIEWS: 1) Helps to fade away scarring. 2) Great skin moisturizer. 3) Perfect for preparing own creams and serums. 4) Some reviewers noticed that oil caused breakups. Ethically Sourced in from the Chilian mountains, bottled and distributed in the United States. Comes with a dropper. It is especially effective in the treatment of damaged, dehydrated skin, scars and blemishes. QUALITY: Undiluted Extra Virgin Grade cold pressed Rosa Moshata. Has no fillers, carrier oils or pesticides. Odorless. CONSUMER REVIEWS: 1) Helps to fade away scarring. 2) Brings eczema relief. 3) Removes suffering from an itchy, stretching belly during pregnancy. 4) Non-greasy. 1. Valerón-Almazán, P. , Gómez-Duaso, A. , Santana-Molina, N. , García-Bello, M. and Carretero, G. (2015) Evolution of Post-Surgical Scars Treated with Pure Rosehip Seed Oil. Journal of Cosmetics, Dermatological Sciences and Applications, 5, 161-167. doi: 10.4236/jcdsa.2015.52019.